8 Korean textile factories established in Haiti : Elansia S.A., Centri Group S.A., Haiti Cheung Won S.A., Hansae Haiti S.A., H&H Textiles S.A., MBI HAITI S.A., Pacific sports Haiti S.A. and The Willbes Haitian S.A., which account for nearly one third of $926 million in exports and thousands of jobs, wrote to the Association of Industries of Haiti (ADIH), to express their deep concerns following the vote of the deputies on March 26 of a bill of law revising the minimum wage which proposes an increase of the minimum wage of the workers of the outsourcing of 78,5% https://www.haitilibre.com/en/news-27295-haiti-politic-revised-minimum-wages-according-to-the-bill-voted-by-the-deputies.html. 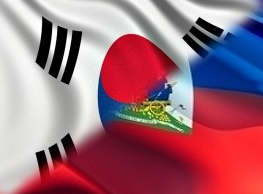 “If the proposal suggested by the Chamber of Deputies comes into force […] This will cause enormous damage not only to us, but to the population and to the whole sector” stating inter alia that the millions of dollars in planned investments for the next three years by Korean textile companies, can not be achieved, also anticipating immediate job losses. ← China’s construction binge spreads to Americas, rattles U.S.